What Processes Control the Freshwater Budget of the Arctic Seas? The Arctic seas are characterized by waters of particularly low salinity, a positive Precipitation minus Evaporation budget, a relatively large freshwater input from river runoff, and a vertical stratification dictated by variations in salinity rather than temperature [1,2,3]. These seas are located upstream of the North Atlantic, where their influence is felt as far as Newfoundland  and likely beyond . Moreover, these seas are particularly affected by global warming  and are likely to be experiencing an accelerating hydrological cycle . How will these seas evolve under such drastic changes in their forcings? To answer this question, we should first have a first-order view of the dynamics that control the ocean climate of these seas, notably the structure of their density/salinity field. My past work was focused upon one Arctic sea in particular, Hudson Bay. The topics I examined included the steady balance of the freshwater sources and sinks , and the processes involved in the seasonal and interannual variability of the freshwaters [8,9]. I am now expanding this work to highlight how these processes vary in importance from one Arctic basin to another, and which parameters dictate this physics . Numerical simulations of an Arctic basin (Hudson Bay). (left) Sea surface salinity from a realistic 3-D sea ice-ocean coupled model. 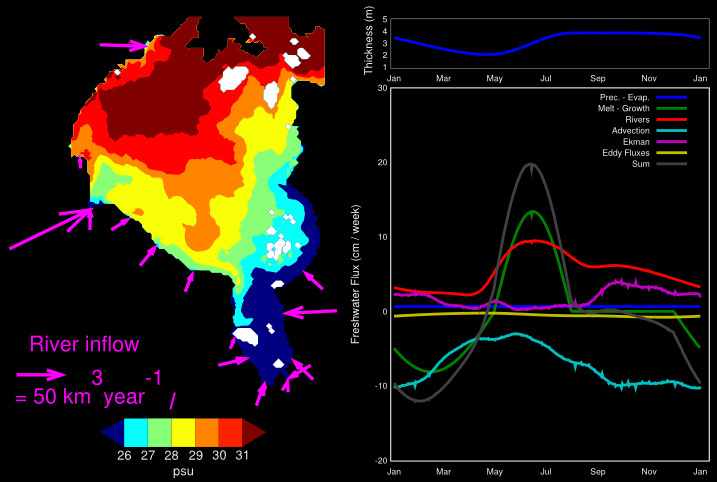 (right) Seasonal freshwater budget from a conceptual model of the same basin. See St-Laurent et al. (2011,2012). Lammers, R.B., Shiklomanov, A.I., Vorosmarty, C.J., Fekete, B.M., Peterson, B.J., 2001. Assessment of contemporary Arctic river runoff based on observational discharge records. J. Geophys. Res. 106, 3321--3334. Steele, M., Morley, R., Ermold, W., 2001. PHC: A global ocean hydrography with a high quality Arctic Ocean. J. Clim. 14, 2079--2087. Dickson, R., Rudels, B., Dye, S., Karcher, M., Meincke, J., Yashayaev, I., 2007. Current estimates of freshwater flux through Arctic and subarctic seas. Prog. Oceanogr. 73, 210--230, doi:10.1016/j.pocean.2006.12.003. Myers, R. A., Akenhead, S. A., Drinkwater, K., 1990. The influence of Hudson Bay runoff and ice-melt on the salinity of the inner Newfoundland Shelf. Atmos.-Ocean 28, 241--256. Chapman, D.C., and R.C. Beardsley, 1989. On the origin of shelf water in the Middle Atlantic Bight. J. Phys. Oceanogr. 19, 384--391. Bernstein, L., Bosch, P., Canziani, O., Chen, Z., Christ, R., Davidson, O., Hare, W., Huq, S., Karoly, D., Kattsov, V., Kundzewicz, Z., Liu, J., Lohmann, U., Manning, M., Matsuno, T., Menne, B., Metz, B., Mirza, M., Nicholls, N., Nurse, L., Pachauri, R., Palutikof, J., Parry, M., Qin, D., Ravindranath, N., Reisinger, A., Ren, J., Riahi, K., Rosenzweig, C., Rusticucci, M., Schneider, S., Sokona, Y., Solomon, S., Stott, P., Stouffer, R., Sugiyama, T., Swart, R., Tirpak, D., Vogel, C., Yohe, G., 2007. Climate change 2007: Synthesis report. Tech. Rep. 4, Intergovernmental Panel on Climate Change. Dery, S.J., Hernandez-Henriquez, M.A., Burford, J.E., Wood, E.F., 2009. Observational evidence of an intensifying hydrological cycle in northern canada. Geophys. Res. Lett. 36 (L13402), doi:10.1029/2009GL038852. St-Laurent, P., F. Straneo, J.-F. Dumais, and D.G. Barber, 2011. What is the fate of the river waters of Hudson Bay? J. Mar. Syst., 88, p.352-361, doi:10.1016/j.jmarsys.2011.02.004, preprint. St-Laurent, P., F. Straneo, and D.G. Barber, 2012. A Conceptual Model of an Arctic Sea. J. Geophys. Res., vol. 117, C06010, doi:10.1029/2011jc007652, preprint. St-Laurent, P., and F. Straneo. On the Controls behind the Freshwater Balance of Arctic Seas, In Prep.